Saturday featured the best of the Race 4 Eight and Senior Race 4 Eight live on the Watch ESPN App for the first time in 2015 from Houston’s Tellepsen YMCA. Houston’s Elite 8 battled for spots in Saturday night’s primetime semifinal, with Tucson’s Luis Moreno and David Fink facing off in the morning’s first clash. Tied at four in game one, Moreno shifted gears and decimated his local sparring partner, advancing 15-7, 15-1. Mando Ortiz faced Sean Lenning in the second quarterfinal and appeared to regain the form that saw him shock Paul Brady at the 2014 WPH Player’s championship. Ortiz won game one in just seven minutes, allowing Lenning to score just five points. Lenning completely reversed the momentum, as Ortiz inexplicably faded. Lenning scored 30 of the next 32 points in just 14 minutes, advancing to the semifinal, 2-15, 15-2, 15-0. WPH #1 Paul Brady faced Daniel Cordova for the first time in the third quarterfinal. Cordova proved that he has the game to hang with the best in the sport, tying Brady at four in both games. Brady built a lead and extended his lead in both games, cruising to a 15-6, 15-5 victory. Emmett Peixoto and Marcos Chavez renewed their Northern California/Southern California rivalry that started in the late 1990’s in the day’s final quarterfinal match. Peixoto looked like the best player in the draw in game one, flawlessly dismantling Chavez, 15-2. Chavez rallied in game two, finding different serves and strategies to combat Peixoto’s aggressiveness. Chavez grooved his right corner and back wall kill and forced a third frame, 15-12. Peixoto regained the momentum in the tiebreaker, aided by back wall kills and crucial Chavez errors. Peixoto stretched a 5-1 tiebreaker lead to a 15-5 victory, extending his winning streak over his Race rival to three over the past 12 months. Paul Brady faced Emmett Peixoto for the fifth time in the past 10 months in the second R48 semifinal. Brady was nearly perfect in game one, cruising to a one game lead, 15-5. Peixoto battled in game two, taking a 6-4 lead and staying within striking distance throughout the frame. Peixoto trailed 11-10 before two Brady kill shots extended his lead to 13-10. Peixoto continued to press the action, serving at 13-14 to force overtime. Peixoto’s normally reliable reverse-hop serve to the left came up short and a weak second serve yielded a Brady side out. Brady clinched the match and a spot in the final on his third match point, 15-5, 15-13. 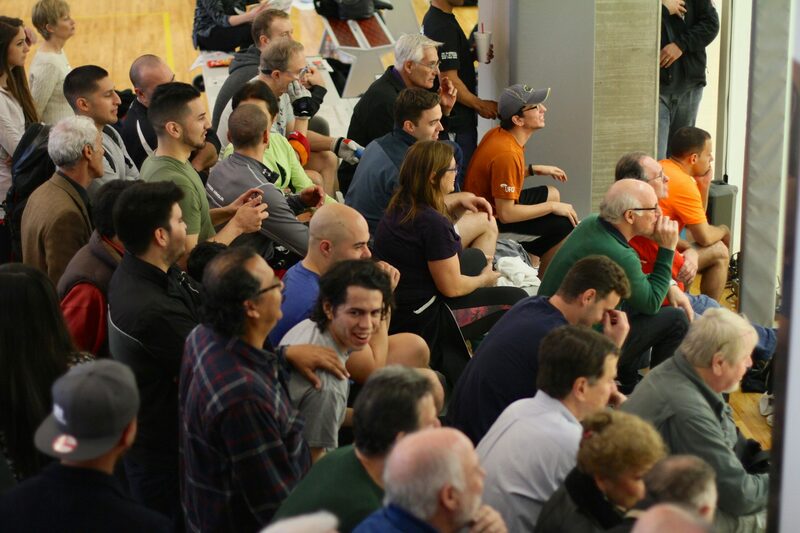 Tyler Hamel avenged his 2014 SR48 Houston Finals loss to Marcos Chavez in the first SR48 semifinal. 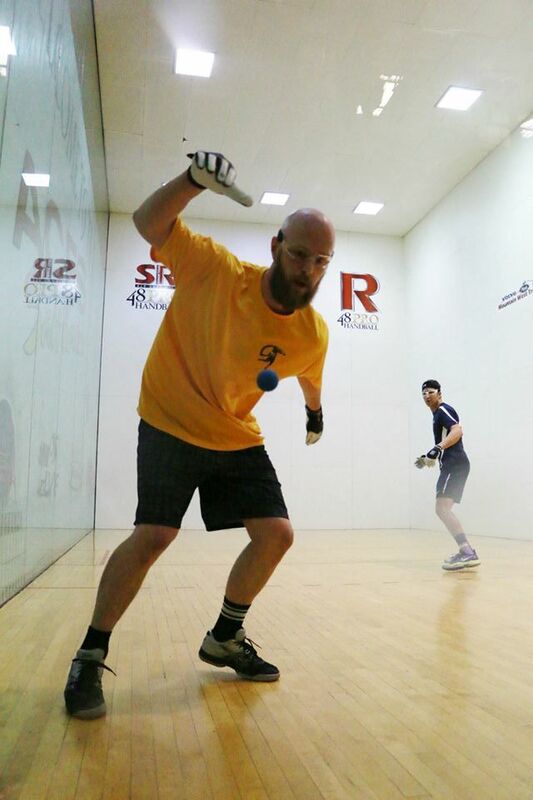 Despite playing handball just three times in the past six months, Hamel looked like “The Sleek Panther” of old, playing error-free handball and consistently executing flat back wall kills. Hamel advanced to the final, 25-18. Naty Alvarado renewed his rivalry with Andy Schad in the second SR48 semifinal, and appeared to be in vintage Alvarado form. “El Tigre” ran Schad from side-to-side and executed kills at will, advancing to the final, 25-9. Broadcast begins at 10am Central (11am Eastern, 9am Mountain, 8am Pacific) on Sunday, January 25th on ESPN and the WatchESPN App. Once on that APP, you can watch all the on-demand videos (Replay) from Saturday’s action.